On Thursday, they had a two hour delay because of the foot of snow we got overnight. We're only supposed to get a couple inches over the weekend - which I hope holds up because it's warm out and that means lake effect snow (where we get massive amounts of snow dumped on us with no warning). Thanks, Lake Ontario. I received a copy of the book from Netgalley in exchange for my honest review. Pawn really surprised me. It has such an interesting and unique premise and I am already dying for the sequel. It is definitely one of my favorite reads of 2013. I really appreciate Aimee Carter's progression through the story. There isn't a great deal of info dumping, but rather the plot unfolds and gives just enough information to understand what is going on. 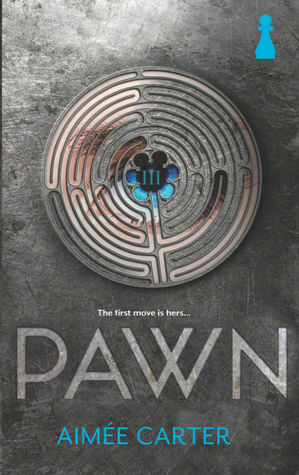 Pawn is full of adventure, action, deceit, drama, and pretty much everything in between. Kitty Doe is an incredible force to be reckoned with. She is everything a YA protagonist should be. She fights for what she believes in and is true to herself. There is an unbelievable amount of twists and turns that made this book hard for me to put down. In fact, I had reached 50% and said,"Let me finish this chapter and I'll go to sleep", just to realize that I read more than planned and was at 74% when I finally turned off my Kindle to go to sleep :) I highly recommend this book for fans of dystopia. A truly amazing read! For more reviews and book related awesomeness, you can connect with me on Goodreads: here.